Are You Ordering The Right Coffee? Arno Holschuh is the Vice President of Production for the Blue Bottle Coffee Company. He’s been in coffee for a decade, and is almost as shocked as his father that this has turned out to be a viable career option. This post was originally published on June 30, 2014. When I was a barista, I got it all the time. A customer walks in, marches up to the counter, assumes the demeanor of a connoisseur, and demands: dark roast. It was a dicey moment, because at Blue Bottle we do not have any true darkly roasted coffees. Our dark-o-meter tops out at a comfortable medium. It’s what we like, and we’re not going to do things we don’t like. So, you start trotting out the sales pitch. We think this coffee is full-bodied; when you say dark, do you mean full-bodied? This coffee has notes of cocoa — everyone likes cocoa! 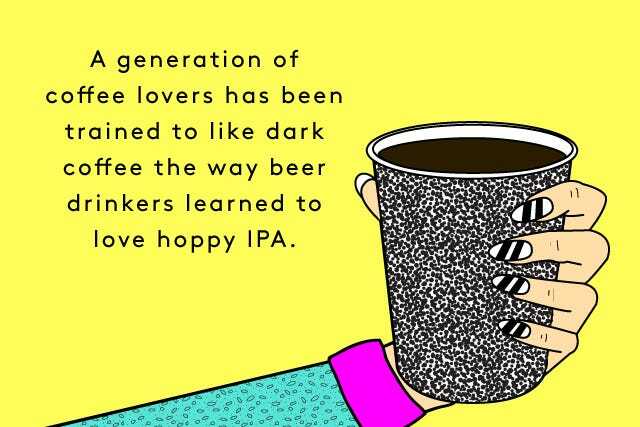 But, in reality, a whole generation of coffee lovers has been trained to like dark coffee the way a whole generation of beer drinkers (myself included) has been taught to love hoppy IPAs. The best argument for super-light roasted coffee, and it is a good one, is that over-roasting tends to smudge the individual fingerprint of the coffee. It’s easy to tell the difference between a Kenyan coffee and an Ethiopian one when they have been roasted to a very light level. This is because roasting involves the destruction of organic acids, and therefore it can muddle the mix of organic acids that the plant’s genetics and growing conditions have put in place. 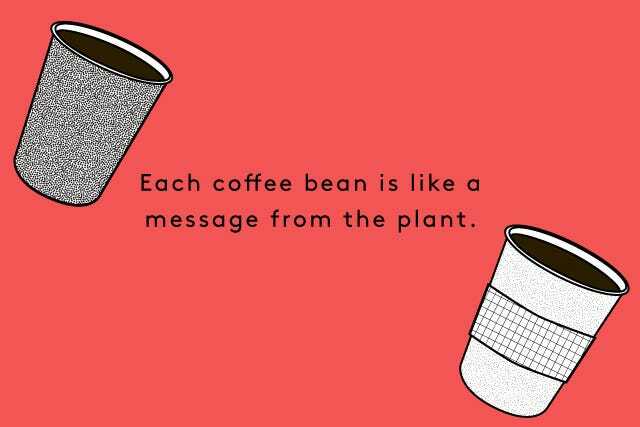 Each coffee bean is like a message from the plant: I got this much sun, this much water, this much fertilizer, and I came from this or that strain of plant. Truly darkly roasted coffees are brutalist, erasing any individual identifying characteristics the beans may have been born with. 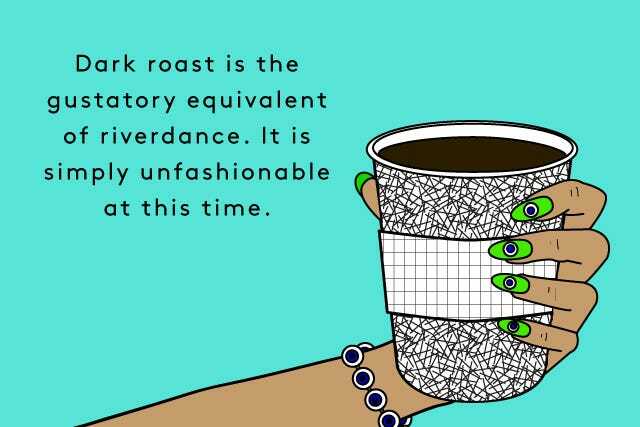 This explains why the dark roast has fallen prey to the same fate as the caprese salad or ultra-oaky chardonnays; it is the gustatory equivalent of Riverdance. It is simply unfashionable at this time. But, if dark coffee is autocratic, then light coffees tend to bring out religious fervor. People in the industry get very focused on trying to preserve the information encoded in the coffee, rather than focusing on what is yummy. And, there’s an arms race aspect to it, as certain companies try to outdo each other by roasting the coffee lighter. I joke that some coffee was roasted with a Bic lighter; the resulting product is sweet, explosively tart, filled with information, and kind of hard to wrap your head around. Comfort food it is not; it’s not even approachable. The language is one of a social movement, trying to reform the way you view your coffee. I’ve heard many times that we should be “redefining coffee as a culinary object,” which is both more ambitious and more wackadoodle than focusing on delicious coffee. I’ve been scolded for roasting too dark because I was disrespecting the coffee farmer by destroying their information. At the end of the day, we need to be doing work that meets our customers’ desires. I often admonish roasters that it doesn’t matter how well they do their job if no one buys the coffee. That doesn’t mean our tastes are dictated by the masses. We are quirky, and we know what we like. But, we want to invite others to like it with us, rather than seek some moral high ground. 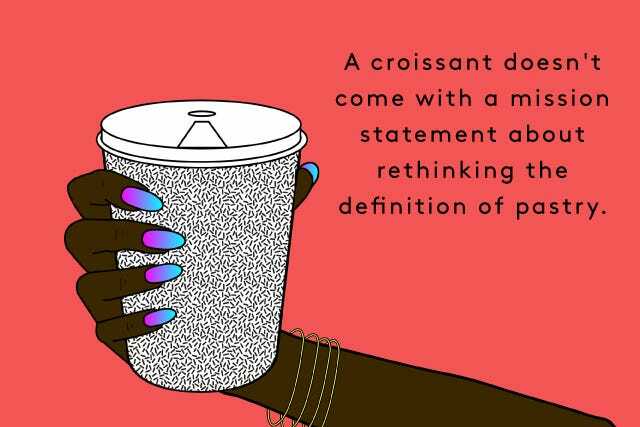 Consider the croissant: They never come with a mission statement about how you should rethink your definition of pastry and what it means to you. They are content to be merely awesome.